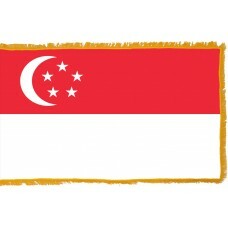 The Singapore Flag consists of two equal horizontal bands. The top half of the flag is red and the bottom half of the flag is white. 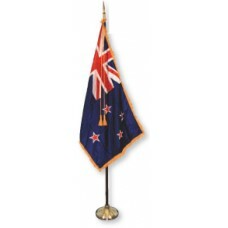 In the top left hand corner of the flag is a white crescent moon that is facing five 5-pointed stars that are in the shape of a pentagon. The color red represents the "universal brotherhood and equality of man" and the color white represents "pervading and everlasting purity and virtue. The moon represents "a young nation on the ascendant" and the five stars on the Singapore flag represent "the nation's ideals of democracy, peace, progress, justice, and equality." 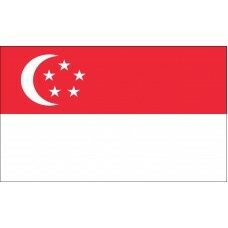 The Singapore flag was adopted on December 3rd, 1959, which was the same year the country became self-governing. 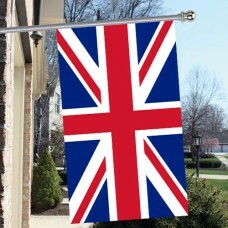 From 1819-1959 the Union Jack flag was used as the country’s national flag. Singapore is an island country as well as a sovereign city state in Southeast Asia and is one of the smallest countries in the world. There is no capital as it is both a city and a country and it is thought to be one of the most expensive cities in the world. It is just one of three city states that are still surviving, with the other two being, Monaco, and Vatican City. Singapore is made up of 63 islands and its main island is called Pulau Ujong. It is thought to be the least corrupt state in Asia and it is the fifth least corrupt state in the world. The island was first discovered by Sir Thomas Stamford Raffles, from the British East India Trading Company, who arrived on the islands on January 28th, 1819. Following his arrival, Stamford Raffles bought the island and began to use it as a trading post. On February 6th, 1819, a treaty was signed that granted permission to the British to establish trading posts and by 1824, Singapore was a British possession. During WWII, the Japanese invaded which resulted in the "Battle of Singapore." On February 15th, 1945, the British forces surrendered in what Winston Churchill claimed to be "The worst disaster and largest capitulation in British history." Approximately 5,000 people died during the battle and 80,000 were captured. The Japanese army deemed themselves victorious and renamed Singapore to "Syonan-to" which translates as "Light of the South." On September 2nd, 1945, the Japanese army surrendered and British, Indian, and Australian forces re-occupied Singapore. In 1959, Singapore became a self-governing state and by 1963, Singapore separated from the British which resulted in their full independence in 1965. Singapore's entire economy is reliant on shipping. It is recognized as "the easiest place to do business" by the world bank and Singapore is also known as one of the "Four Asian Tigers" (the other three are Hong Kong, South Korea, and Taiwan) due to their highly developed economies.